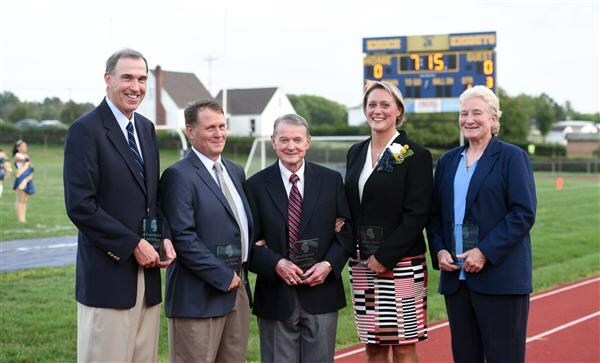 Five individuals will become the 2016 Hall of Fame Class - dedicated to recognizing the athletic accomplishments and leadership contributions of those associated with Knoch High School sports since its inception in the late 1950’s. This will be the second group of honorees since the Hall of Fame was established last year. Leading the list of inductees is perhaps one of the most versatile athletes in school history. A 1984 graduate, A.J. Pagano excelled in all three sports he participated in at Knoch – Football, Basketball and Track, lettering in each sport all three years. Known mostly for his accomplishments on the football field, Pagano was an outstanding basketball player, and an extremely successful runner of the track team. But it was his prowess as a running back that propelled him beyond high school into the college ranks where he was an all-american running back at Washington and Jefferson College. A.J. was the first running back at Knoch to eclipse the 1,000 yard mark in a single season, finishing his career as the schools’ all-time leading rusher with 2,350 yards, and the Knights all-time scoring leader. A.J. earned First Team recognition in his senior year with the Pittsburgh Post Gazette, Pittsburgh Press. He was inducted into the Pennsylvania Sports Hall of Fame in 2004. A.J.’s honors earned at W&J are numerous – including first team all-conference honors each year from 1984-1987, and selected as the President’s Athletic Conference Offensive MVP in both 1986 and 1987. His senior year, AJ was named to various All-American Teams including the Kodak, Pizza Hut, and Football News – and was presented with the Dapper Dan Collegiate Award. Renee Lassinger is a 1986 Knoch graduate who excelled in volleyball and track throughout her high school career. Renee earned four letters in volleyball, and earned numerous all-star honors including team VP her senior year, and was named to the all-section second team two consecutive seasons. Renee also lettered three years in track, earning MVP honors all three years, specializing in discus, shot put, and high jump. She was named AIC MVP in field at the Fort Pitt Invitational in both her Junior and Senior years. She also has served as a Volleyball referee at her alma mater – Vanderbilt University. Lisa Pfeiffer is a 1977 Knoch graduates who excelled in both basketball and volleyball, earning a total of 7 letters – earning one every season she was part of the team. Lisa was an integral part of Knoch’s section champions in 1974, 1975 and 1977, and scored over 400 career kills. Lisa was the team’s MVP in 1977. In basketball, Lisa was named offensive player of the year her senior year for most rebounds and foul shooting. She was named MVP of the Lower Burrell tournament in 1976, where she averaged 28 points per game. Lisa attended Slippery Rock State College where she played two years of varisty volleyball before being sidelined with an injury. Following her collegiate career, Lisa participated in Senior Olympics playing both softball and basketball. Doug Clark is a 1963 graduate who played both football and basketball, serving as captain of both teams his senior year. During his three seasons on the basketball squad Doug set both the career scoring record and single season mark, and was Butler County’s leading scorer in 1962-63. He was part of Knoch’s 1961-62, and 1962-63 District 9 Championship teams, earning an honorable mention on the All-State team in 1962-63. Doug was an outstanding collegiate basketball player at Rutgers University, where he started for three seasons alongside 1st team all-American Bob Lloyd, and the late Jim Valvano. Their 1966-67 team has been recognized as one of Rutger’s greatest ever. Doug was inducted into the Butler County Sports Hall of Fame in 1996. The final inductee is the first individual to be honored with induction to the Hall of Fame for their dedication and support of Knoch Athletics. Regis Scheibel started his career at Knoch in 1957 as a math teacher. But most will remember him as Knoch High School’s Assistant Principal until 1993, and the “Voice of Knoch High School” as the only stadium announcer at Knoch until his retirement just a few years ago. Mr. Scheibel has been the Knight’s biggest fan both at sporting events and in the classroom. He has served as the President and Chariman of the Knoch High School Education Foundation which annually awards thousands of dollars in scholarships and loans that allow Knoch graduates to further their education. Mr. Schiebel is also a member of the Knoch High School Sports Hall of Fame Committee.